Plan W2732 includes a beaver, a fox and a skunk. 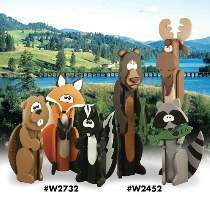 Plan W2452 includes a bear, a moose and a racoon. All projects are made from 4” diameter landscape posts and 3/4" lumber. All patterns drawn FULL SIZE.